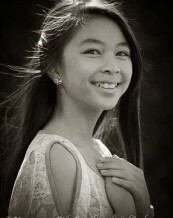 Angelica Huynh, 13 years old, is going to attend 8th grade at Sierra Middle School in 2013. One of the best 12 students that awarded a visit to Washington DC. She loves music, singing ( attending advanced choir class) and taking violin lesson. Angelica joined Catherine Nguyen and others to build a system at Vinh Son 2 orphanage in Kontum Vietnam. "Clean Water in Vietnam - A Project of Viet Dreams"